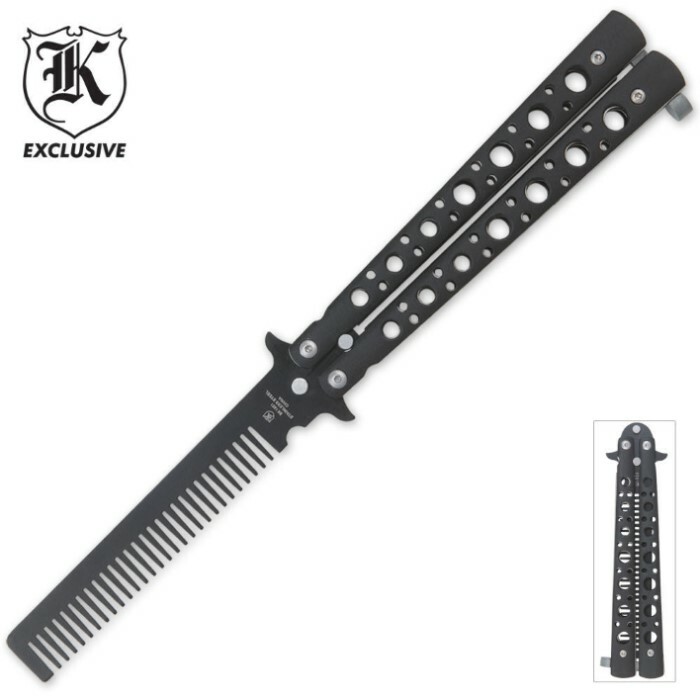 Butterfly Hair Comb | BUDK.com - Knives & Swords At The Lowest Prices! This butterfly opening hair comb will get their attention when you sling it open and comb back your Elvis part. Its stainless and ABS construction is built tough to last years of combing even the kinkiest hair. Originally, the butterfly knife was very firm, to where it didn't actually spin, but rather you'd have to forcefully cause the knife to turn. Customer service was excellent and they sent me another one - the 2nd was better, but still a bit stiff. But overall a good product and good quality. I got this a Christmas present for my 7 year old. The quality was much better than I expected based on other reviews. For the price, I think it is really cool. My little guy is going to love this! He won't even use it as a comb but I don't have to worry that he will chop a finger off! Functionality wise, it will do. Though it isn't the best comb, nor is it the best balisong trainer. At this price point, I would say it was an okay buy. The metal is thin and easily bendable, and the handle is mostly polymer. I should have read the description, which was pretty accurate. Got this as a BOGO. Gave one to my son and one to my boyfriend. My boyfriend pointed out that it opens backwards so to be careful when closing it in a hurry. And both of them have thick hair and say it kind of pulls when their hair gets a little longer. My boyfriends keeps his really short so it's not a real problem for him but is for my son. Other than that we haven't had any problems with loose screw or anything so 2 thumbs up on the butterfly comb from us! the comb was more than good at first... but after dropping it once, two of the screws came out and made it useless. however, the day of use i got with it was amazing! The comb had some very sharp edges. When the manufacturer beveled the ends of the teeth they created some very sharp edges along one side and in between the teeth when they pressed it. A few minutes with a small file fixed that but the ends are no longer black. Other than that I don't have any complaints worth mentioning. If not for the sharp edges I'd have given it a 4, maybe even a 5. In spite of the sharp edges I'd buy more, especially on sale. I got 2. The pivot screw fell right out of one (customer service was no help at all). But the other is fun to play with, without scaring anyone. Great butterfly comb this is my first order with budk and I am impressed with budk so far keep it up budk. There is one thing you might want to check before using this, make sure that the screws are tight.